Vacation rental condominium. Sleeps 17, 6 bedrooms, 3 bathrooms. No pets allowed. 6 Bedroom, 3 Bath with loft featuring a full sized kitchen, bar with countertop, 2 tables for optimal seating. 2 living rooms, one with a stone fireplace, TV, VCR, beautiful deck facing the slopes and living room two has a pool table, TV, DVD/VCR and a double murphy bed. Outdoor hottub and access to Big Bird Trail. High speed wireless internet. Great place for big groups! Loved this place! We had a group of 13 and it was perfect for that size. Everyone had their own place to go. Everything was clean and organized and fully stocked! The convenience of skiing in and out was fantastic. Would definitely stay here again. The only thing, and this should tell you how awesome this place was, because this is minor, is that the pool table, which is advertised as a feature, is awful. There was only one working cue and it really needs to be recovered. It’s right next to the ski storage area and I suspect everyone sets their stuff on it. But how minor is that?!!! We’ll be back!! Our entire family spent Christmas in Snowflake and the house was perfect. We had 17 people in our party and it accommodated us all comfortably. The kids were first time skiers and having the ability to watch them right out the window was an extra bonus. The house was clean, fully stocked with everything from dishes to linens. Will be coming back. This year was our 34th year at Big Powderhorn, it has become a family tradition. 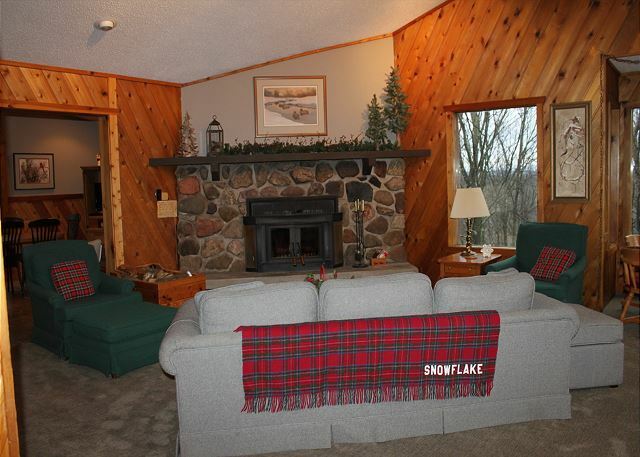 For the last 30 years, we have had the pleasure of staying at the Snowflake chalet. It is in the best location and large enough to accommodate my 3 children's families and my wife and I. The chalet is outstanding and the people at the main lodge are extremely friendly and helpful. Big Powderhorn is the best skiing in the Midwest. I would recommend this resort to anyone. Best Chalet Rental in the North! Shhhhh.....don't tell anyone! Snowflake is the go-to rental for our family when we visit the area. The kitchen is large, clean, and fully stocked with needed equipment for our stay. The addition of a couple bedrooms and dining area several years ago just added to the comfort and space to enjoy! Snowflake is always very clean and free of clutter. It is well-appointed with comfortable, clean furniture and suitable décor. Did I mention it is very clean! Though rarely needed, the management company was always available during day and accommodating to our stay. There is also a nice deck high above the ground so that mosquitos are at a minimum in the summer. 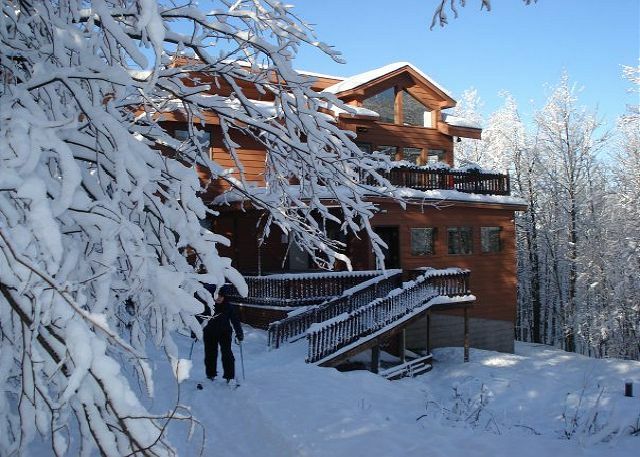 Rarely stay in the winter but when we have, comfort is the same and you can ski right to the chalet from the hill! Spouse, kids and grandkids were all happy! Snowflake was very functional. The hot tub was down for repair but was running the next day. We have been to Snowflake several times. 14 family memebers from 3 generations. Lots of room to be together or by yourself. Snowflake makes sking easy for all levels of skiers. 7 grandchildren have learned to ski here. This was our 4th year staying at Snowflake. What a great place for our needs. Staff at lodge were all very polite and helpful. Antonella, lodging manager is wonderful to work with. All reserved for 2019. We had a great time staying at Snowflake at Big Powderhorn Mountain. Snowflake has lots of room for kids and adults to gather. The kitchen was well stocked. Everything was very clean. The outdoor hot tub was a hit. And the pool table was used a lot too! The location on Big Bird can’t be beat. Snow was amazing! Staff responded quickly when we needed more water. Snowflake is comfortable, relaxing and an overall wonderful place to spend time. We had a group of 11 people and had plenty of room. Wish there was more snow, but that is the nature of the beast when you go in late March to ski. Awesome location on the hill. Everything we needed to cook was all available. The only thing needing attention was the hot tub. It needed a new filter and the jets were not working properly. The boys loved the pool table and there was a lot of games and cards to entertain everyone. We would definitely stay here again. We come to Powderhorn every year with several families. 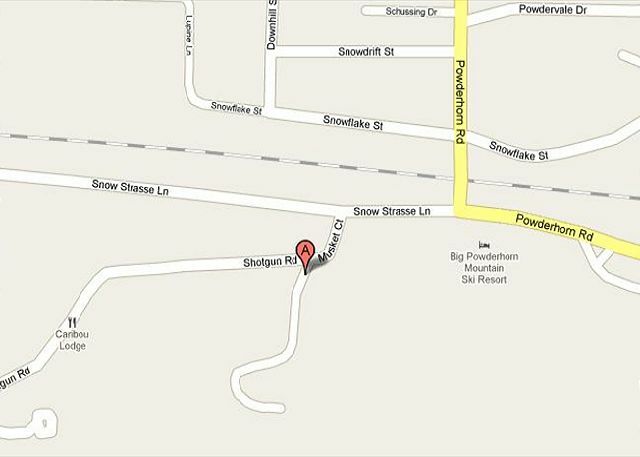 Snowflake met all our needs and was situated in a great location! Love Snowflake Condo. This was our third year staying at Snowflake. Already reserved for next year. Great location. Nice and clean condo. Lots of space. Great kitchen. 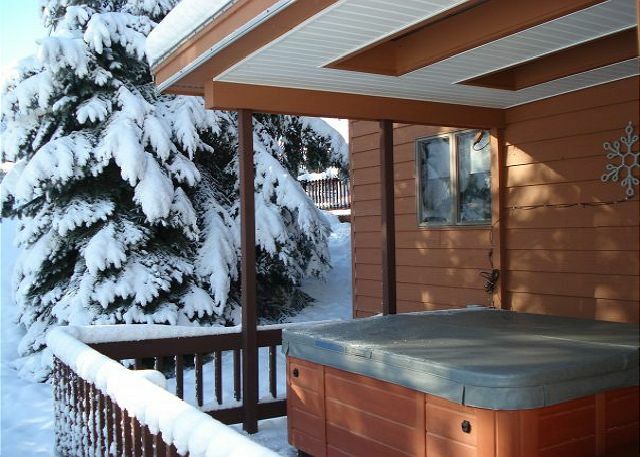 Outdoor hot tub is great after a day on the slopes or snowshoeing. We have stayed in this rental twice before in the past. We wanted to return because 2 if the kids are graduating this year and probably will be their last time going. In the past it was just the 2 families. This year it was 3. We love staying at this house right on the hill. We hope to return. Avfew things... The hot tub was sub par. First water low. Then water was added during our stay but took 12 hours to warm up so we weren't able to use it except for late that night and early on checkout morning. Also the couches could use some cleaning under the cushions. We lost remote once and pulled cushions up to look. Lots of food crumbs from previous guests. Office staff were very nice and accomodating. We have been skiing Powderhorn for 17 years and this year was our second time at Snowflake. It is perfect for our large group. Perfect for ski in and ski out. Everyone has space to spread out and we all have space to be together. Very clean and kitchen is well equipped. Great service from Antonella in reservations. Can't wait for next year to be at Snowflake again. Snowflake was perfect for our large group. All children could ski Big Bird anytime they wanted on their own, it was right outside the condo. Perfect location to all ski lifts. The condo was in perfect condition, clean and lots of space for everyone to spread out. The kitchen was well supplied. The outside hot tub was in great condition and very popular with our group. Great place for large groups. Wonderful time for my family to be together for my nephew's wedding in ironwood, michigan. Great location and lots of room to enjoy. Our rental experience was awesome! From the beginning to the end. Antonella was very polite, helpful, and easy to work with. I had many questions prior to our stay. She was prompt with reply's and very accommodating! Snowflake is a beautiful place, well kept and provided everything we needed. We enjoyed our time there. My grandparents are originally from Ironwood so I still have family in Bessemer. We were able to spend time with them as well as utilize Snowflake and spend our time together as a family. I would definitely recommend your company and spaces to friends and family. Our hope is to repeat this years experience again next year. It is a GREAT place to stay. We (12 to 18 male skiers from 17 to 72 years old) have been going skiing in the UPPER for the past 30 consecutive years and this is the best place we have stayed. Easy access to the slope (ski-in/ski-out). Plenty of parking (4 to 6 vehicles) in the FLAT cul-de-sac. Roads are very well maintained with shuttle service. Big Powderhorn's staff does an outstanding job staying in touch and checking to see if there are any issues. This place has plenty of room and sleeping arrangements with 3 full bathrooms. TVs are in every room. GREAT open area with several couches. It has a hot tub, a pool table, fireplace, a large refrigerator and many other nice items. IT IS A GREAT PLACE TO STAY FOR FAMILES OR GROUPS!!! This is a very nice property. large inside, has a room to put skis, good location on hill, plenty of parking, easy access to unload your car, nice deck with grill. Very happy. Snowflake was a great place for our family. There were 12 of us and loved that we could ski right from the back door and grandma could watch us skiing from the couch. The deep freeze closed the slopes for 3 days and was disappointing but the pool table and tables for games kept us from having to much cabin fever. I loved the kitchen being open to the great room. The two dining tables in the dining area and the the separate family room downstairs with pool table.. everyone had a place to go and we all decided we wanted to buy it and rebuild one just like it. No one wanted to leave. The only downfall was paying the extra for the ski-in/ski-out lodging and the ski resort being closed, very disappointing. Wonderful! Winter sports are great, but if you miss out on summer in the UP, you're missing out on heaven! As a local, I knew where to bring my brothers and sisters for our family reunion. We climbed the hill the first morning we were there and found a newborn fawn hiding in the grass. The variety of birds and plants were endless. Snowflake is perfect for 8 to 17 people as there are plentiful beds, bathrooms, and even family rooms! We had such a wonderful time, and the staff there really cares about customer service. We cant wait to do it again! We all had an amazing experience at Snowflake and will definitely be returning in the future! Grandparents, parents and grandkids had a great time. Skiing in fresh 6-10" powder was a treat, home was perfect for our needs, and what fun to be on the slope. Highly recommend the experience! We had a fabulous time enjoying the slopes with our sons and their families. Your employes were great with the younger kids Snowflake is beautiful we loved the hot tub.We hope to come again.We need to save up as it is expensive. The new lodge is lovely and your staff were very nice and helpful. Many Thanks. Great Location, ample space for relaxing and dining with the group 13 people total. The only thing that was a concern was the showers. Water pressure was marginal at best and two out of three drains were clogged. I would recommend and stay at this place again. 15 inches of fresh powder our 1st day of skiing and no broken bones is a good ski trip in anyones book. Long time customers of Big Powderhorn Mountain! We are a group of high school friends that have made this an annual event for 22 years now. I would like to think we have stayed in numerous units over the years and Snowflake is our favorite. Best location on the ski hill and nicely kept up. Sometimes it can be difficult to book during the winter months, but that's because it IS the best unit. We have stayed at Snowflake at least 5 times and love it every time. The location is the best because you are right next to the beginner slope for the kids and any new skiers. You are so close to the lodge and get a great view of all the skiers. The house is perfect for a large family. There is plenty of room for everyone to be together or to find a quiet spot all alone. The kids in our group were staring out the window as we were loading the car and I over heard them saying I wish we never had to leave this place. I love Snowflake. Our family came from around the USA to stay in the town (Bessemer) where we had all grown up, to attend a cousin's wedding and to facilitate our younger brother's passing/internment. This was a bitter/sweet weekend with the potential for nerves and emotions to run high. Our family agrees completely that staying together was a very good idea. We didn't need complications while taking care of our family business. Our stay at Snowflake was a blessing. The facilities were perfect! Our comfort was maximized by the chalet's ameneties/visuals and the staff's professional attention. I believe I speak for my family when I say that BPMRL was a very smart choice for us. That the chalet (Snowflake) was the perfect location and facility. Our family thanks BPMRL for providing us the ultimate in comfort. We will have this time together to talk about for many years to come and should we need residency in Bessemer again, we know where we can go to be at ease during difficult times or just for pleasure. I think this is our 4th time staying at Snowflake.We have always had a great experience at Snowflake, the only negatives this time was there were a lot of Carpenter ants through out the unit and that made it uncomfortable for some of the other family members and I wish the would empty and fill the hot tub after each rental(it seemed very cloudy) otherwise we love this place, we have been renting at Powderhorn for 15 yrs and this is one of our favorites. Best Unit on the Hill!!! After spending the last 20 years renting different units on and around Big Powderhorn Mountain, this is our favorite unit. It fills up fast every year and it can be somewhat challenging to reserve the weekend you desire. Great place to stay. It has everything you would want. We were slightly disappointed that the hot tub did not work correctly. Snowflake was a GREAT place to stay - ski in/out! Spacious and very nicely decorated with many TVs. Many single beds as well as several queen beds. Very large kitchen and dining area. Located conviently next to a ski run that goes to the lodge. Big Powderhorn was well groomed as usual and everyone was helpful and very friendly. This was my 19th consecutive trip to the UPPER and the 28th for a couple of others skiers in Team Kamikaze. Snowflake was the best place we have ever stayed in the UPPER!!! This was our 19th year staying at Snowflake Chalet and our 27th year at Big Powderhorn Mountain. The location could not be better for a ski-in/ski-out. Over the years that we have stayed at Snowflake, the Owners have made many improvements to the Chalet. We have already made our reservations at Snowflake for next year and plan to do so for many more years. neices especially love the loft, they used it for their "clubhouse". Snowflake Chalet is one of the nicest properties on Powderhorn, if not THE nicest. We will definitely be back! Snowflake was just what we had hoped for in accomodations, access to the hill, and amenities like TV's, rec room, AND FIREPLACE. The unit was comfortable for our eight adults and two young children. We were, however, very disappointed for having been misled by Antoinella, who said the unit had Wi-Fi. It did not. Had we been given accurate information, our daughter could have made her phone a "hotspot," allowing us internet access from the unit. Such access was crucial for three of the party who had planned to do some work FROM THE UNIT (going to Caribou was NOT convenient). Antoinella did nothing to make up for her misinformation. This was our 20th year at Powderhorn. We have stayed in over 10 of the best units offered, and Snowflake is definately our favorite. Our group consists of 10 to 15 guys each year. We already booked our stay for next year. Thank you for the recent remodel / addition. You managed to make the best unit even better! We always love traveling up north to ski with our family. It would have been nice to be informed that the main lodge burnt down. It did affect our stay/experience especially when you have children that do not ski all day. Overall we still had a fabulous time and Snowflake is the best!!!! The property was spotless when we arrived. Very user friendly with lots of utensils in the kitchen. We did not need to bring the crockpot and griddles that we lugged with. Loved the open space for a large group - quiet areas but yet we were all together. Only complaint was the large screen tv speakers - cant hear the tv from the white couch but everyone else in the house can! Housekeeping was wonderful and very timely on our requests for more garbage bags, water and service to the shower. Check in staff was wonderful and very helpful - would love to return next year but it is unavailable all weekends already! Should consider giving current renters 1st chance on same weekend next year. Grandma enjoyed her first ski weekend with the entire family - spill over stayed in town in a hotel. Thanks for a great time! This was our family's 26th year at Big Powderhorn and we have never had a bad experience with accommodations. Big Powderhorn Mountain has always been a family friendly resort and is one of the few ski resorts that have ski-in and ski-out from the chalets.